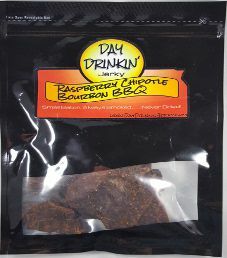 The next review for Day Drinkin’ Jerky will be on a 4 ounce/113 gram bag of their Bourbon Black Pepper flavored beef jerky. 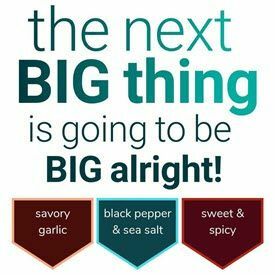 This flavor is described as having soy and a bold black pepper spice that melds into a nice Bourbon brown sugar finish, which lingers on the palette. The bag was kindly submitted for review by the owner, John Day. 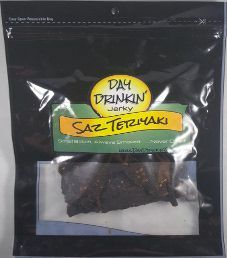 The Day Drinkin’ Jerky name come from 2 facts: 1) John’s last name is Day, 2) All marinades have an alcohol as a primary ingredient. 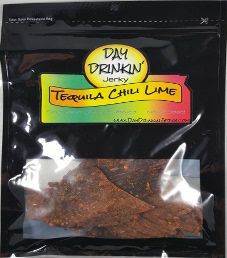 The next review for Day Drinkin’ Jerky will be on a 3 ounce/85 gram bag of their Rum Lime Sriracha flavored beef jerky. 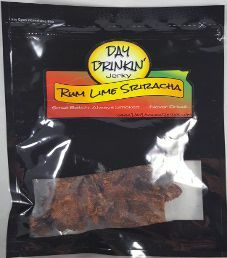 It is described as a mildly spicy and sweet sriracha sauce keyed up with a lime kick, and finished off with rum. This bag was kindly submitted for review by the owner, John Day. 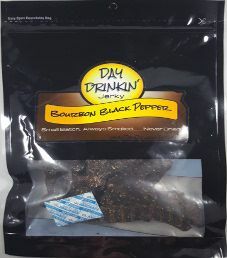 The Day Drinkin’ Jerky name come from 2 facts: 1) John’s last name is Day, 2) All marinades have an alcohol as a primary ingredient.